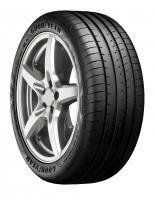 The Goodyear Eagle F1 Asymmetric 5 has just been announced! The Asymmetric 5's predecessor, the Goodyear Eagle F1 Asymmetric 3, has always been one of the most popular tyres here at Tyre Reviews, so it will be really interesting to see how the new tyre fits into the competitive UHP / max performance segment overall. As of yet, no one outside of Goodyear has tested the new tyre, but expect that to change in March next year. Keep an eye on the Tyre Reviews site / subscribe to the Tyre Reviews YouTube channel for full details! For now, here's the press release. Update: As some people have pointed out on facebook, Goodyear skipped the Asymmetric 5. This is most likely due to the number 4 being bad luck in Chinese because it is nearly homophonous to the word "death". Published at December 7th, 2018, 12:25 pm, by Jonathan Benson.